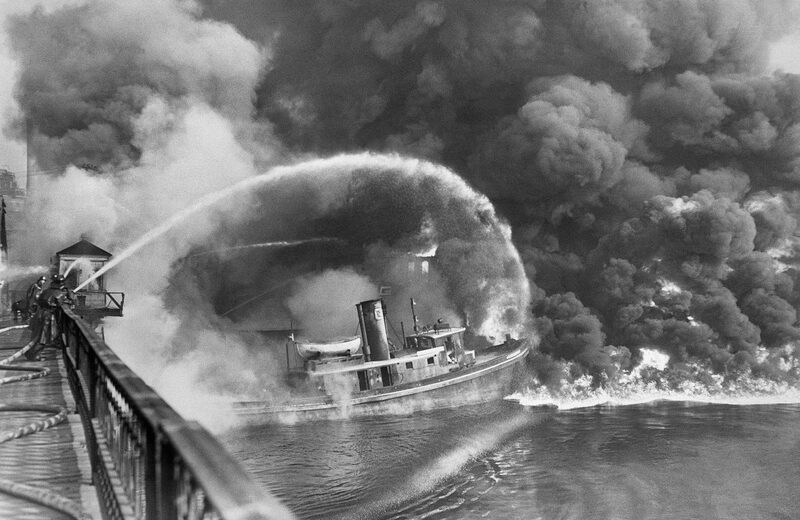 Cuyahoga River photo from 1952 portraying firefighters and a tug boat spraying water on the flames. Image: Flickr. “This is a Great Lakes-wide problem,” said Heiko Schoenfuss, director of an aquatic toxicology lab in St. Cloud, Minnesota. It’s a problem his lab has studied at 16 sites in three rivers, each flowing to one of the Great Lakes, said Heiko, the senior author of a report about the impacts of pollutants on fish published in May in the journal ScienceDirect. The river most affected is the Cuyahoga River in Cleveland that flows into Lake Erie, according to the report. This is the same river once consumed by flames in the ‘60s caused by heavy pollution in the river, said Michael Murray, a staff scientist for the National Wildlife Federation’s Great Lakes Regional Center. Location of three sample sites from the report. While fire is no longer a concern for the river, pollution is still a big part of the conversation. The pollutants nowadays are as diverse as personal care products like shampoo and laundry detergent to pesticides and even hormones, Heiko said. His team at the Aquatic Toxicology Laboratory at St. Cloud State University has a sense of how they got there. The river is much better than it was when she moved to Cleveland 30 years ago, said Agnieszka Wooten, who frequently hikes and paddles the area. Back then, animals like beaver, otter and bald eagles were not seen near the river. Improvements to the water quality in the Cuyahoga River have had a huge impact on animals living in and around the river, Murray said. While the animals are not going belly up, Heiko said the effects of pollutants on fish in both the river and Great Lakes remain a concern. He compares the changes in fish to a home thermostat. You may not notice if someone comes in and changes the temperature a few degrees, but it will show a difference on your monthly bill. Although the pollutants make subtle changes to the fish, they are still safe to eat, Heiko said. “I would definitely eat a fish out of the Cuyahoga River,” he said. Pollution visible beyond a microscope still has some local residents worried, Wooten said. Editors note: This story was updated April 20, 2018, to correct the number of rivers studied. Curtis – Thanks for the heads up. Fixed. It doesn’t look like the title or article received much fact checking. The abstract of the report cited in the article clearly states that 16 sites on 3 rivers (not 16 rivers as stated above) were assessed. In 2005 the detergent industry reformulated to meet state adopted limits on nutrients from this product line. The article mentions detergents as a problem. Is this a new ingredient or problem or was it just a mistake to list detergents?